Are you looking for a great book that encourages kids to learn more about science and technology in a fun and exciting way? 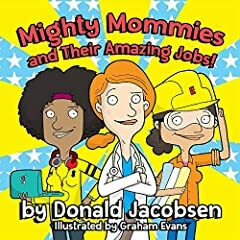 Mighty Mommies and Their Amazing Jobs is an engaging and easy-to-read rhyming picture book that teaches children about various STEM / STEAM careers (Science, Technology, Engineering, Art, and Math). This book is packed with colorful illustrations by artist Graham Evans as well as creative descriptions that will pique the interest of children. Mighty Mommies and Their Amazing Jobs features awesome women in STEM / STEAM careers, which works both to encourage young girls to pursue those careers and also promotes gender positivity. Parents and teachers: because you play such a challenging and meaningful role in the development of children, this book includes free lesson plan resources. Be sure to read to the back of the book to get the lesson plan resources, coloring pages, samples of the author's other books, and more free stuff! Get the audiobook edition for free from the author's website when you buy the Kindle or paperback edition! Get the eBook edition for free via Kindle Matchbook when you buy the paperback edition! Grab your copy of Mighty Mommies and Their Amazing Jobs today to set your kids on the path to learning about awesome STEM careers!